The mother of the Nigerian star singer (Burna Boy), Bose Ogulu stole the Soundcity Awards show yesterday as she shows her own display of fun as she was present to receive all the awards won by her son yesterday. 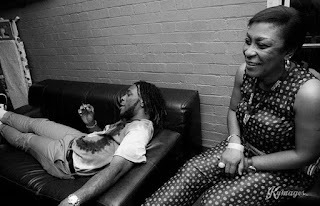 Burna Boy was awarded with three distinctive awards and she was there to receive them all. Climbing the stage, Mama Burna was dancing and this got Nigerians and people there present for the event really excited. In her speech, she thanked the international Music star, Kanye West for making her son make so many hits by releasing his album and calling it 'Ye' which made people all over the world watched her son by mistake and she assures us of seeing more madness from Burna boy this year 2019.